Today is the day! 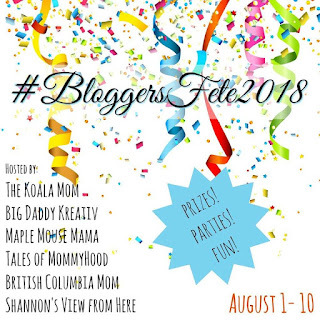 The start of #BloggersFete. 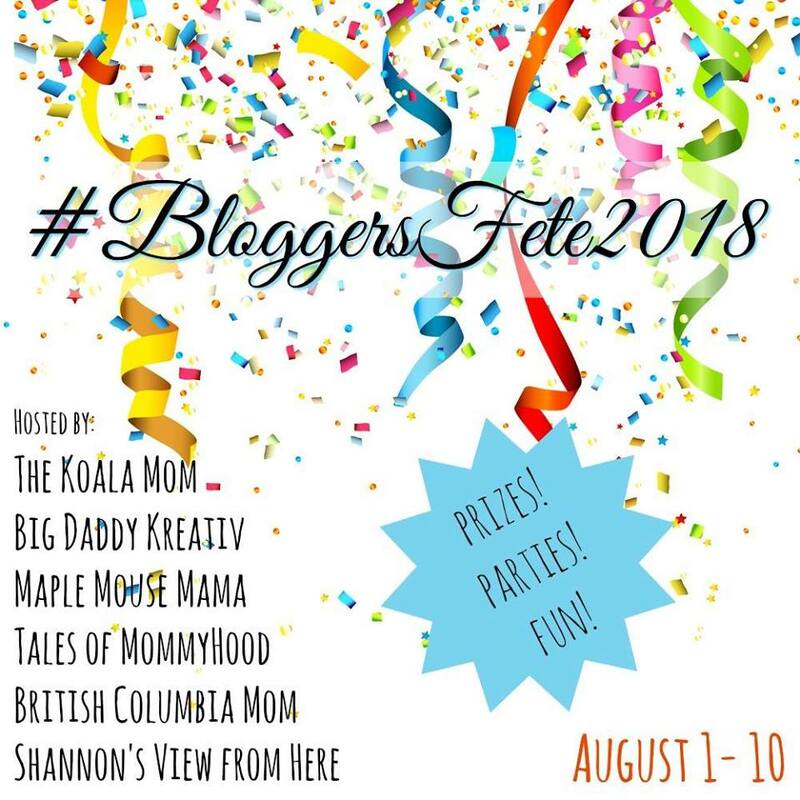 A few years ago, I joined with a group of Canadian bloggers to throw a big party in celebration of our individual blogs anniversaries. We had so much fun, we decided to make it an annual event. This is our FOURTH year! A few of the bloggers have changed over the years, but we are all Canadian, and all very appreciative of our readers. Once again, we have some fantastic sponsors to bring you as many prizes as we can. We are kicking off tonight with a twitter party, we will be doing two instagram loop giveaways (one with a cash prize, and one with product to win), and we will be ending with a facebook party on August 10th. In addition to these fun events, we are also offering giveaways on our blogs! PlaSmart has generously offered up a watermelon ball for one of my readers. This giveaway will run from now until 1159pm EST on August 10th, and is only open to Canadian residents. To enter, leave a comment on this post telling me who would have the most fun with the watermelon ball, and then fill out the giveaway form to be entered. Don't forget to stop by the other blogs and enter their giveaways also! My grandson would have a blast with this! I know my lil guy would have hours of fun with this. Thanks! My 3 kiddos would have a blast playing with a watermelon ball! My daughter would have a lot of fun with this. She loves to play in the water. Thanks! My 3 boys and I would have a blast with it! my daughter and her friends! The whole family would have fun with the watermelon ball! I would play with it with my niece in the pool! My granddaughter and I would have fun with the watermelon ball. My daughter would love the watermelon ball! My grandchildren would have a ball playing with this! My 3 kids would love this! MY girl would have a blast with a watermelon ball! My kids, husband, and I would have fun with the watermelon ball! I'm not sure if my kids or my hubby would have more fun lol. Too cool! my kids would love the watermelon ball. we didnt set up our big pool this year, but itd ne nice to take to the public pool and share - good way to make friends! My boys would have so much fun playing with it! my son and I would love to play with it together! My daughters and neighbors would have lots of fun with it. my 8 yr old would play with this! My two granddaughters would love it! My niece would really enjoy the watermelon ball. I'm sure she would be entertained.I was told I'm a big kid at heart. I would enjoy it with her. My kids would love this! They spend a lot of time in the pool and they would have so much fun with this! My grandkids would love to use it. My kids would love this ball! My nieces would have a lot of fun with the watermelon ball. We all head to grandma's on sunday each week to swim and visit. My 8, 9 and 11 year olds would have a blast with it. My friends son would love the watermelon ball. I think my whole family would have a blast with the watermelon ball at the beach. All of my kids would play with it. My grandson would have a blast playing with the watermelon ball with his cousins and friends. I think this would be fun for our whole family! My son would have lots of fun with the watermelon ball. My kids would have a blast with the watermelon ball! My Son and his friends would have so much fun with this. Every Tuesday and Thursday in the Summer I have my nieces' kids over, 5 of them aged 1 to 9, and they play in my backyard pool and are always looking for new games so this would be perfect! Happy Summer!